How to Transfer Contacts from Old Android to New One Effortlessly? If you are a person who loves the new and loathes the old, or you just wish to keep the pursuit of novelty, you must frequently change your mobile phones. After switch from one phone to another, for example, from an old Android phone to another new Android mobile, you might be realized that it is quite easy to lose precious information. Some may be forgotten to the old Android phone and some may be lost during the data transfer from the old phone to the new one. Files on an Android phone can be stored on SD card, SIM card or directly on the phone's memory. Then, how to transfer contacts from an old Android phone to another new one without any quality or data loss? If you are interested in this question, this article is just for you. Actually there are many ways available for you to transfer files between two mobile phones. Using professional phone to phone transfer tool is the easiest one. Believe it or not, everything can be transferred from one Android phone to another Android with a single click, all what you need is Coolmuster Mobile Transfer or Coolmuster Mobile Transfer for Mac. It is able to transfer contacts, including phone numbers, company names, job title, email address and other contact information from Android to Android with a few minutes. Apart from contacts, Mobile Transfer can also transfer text messages, call logs, apps, photos, videos and music between any two Android devices. It is perfectly compatible with iPhone, iPad, iPod and Samsung, Google, Sony, HTC, LG, Motorola, Huawei, etc. It is fast and convenient to use. You just never need to worry about any quality loss during the files transfer because the software is 100% risk-free and all contacts you transfer are totally the same as original ones. In the next part of the article, we would like to show you how to use the Mobile Transfer on Windows computer. If you are a Mac user, you can download the Mac version of the software and follow the same operations in the below. First of all, download and install the free downloadable Coolmuster Mobile Transfer on your PC. Launch it and you can get its primary interface like below. Plug in the USB cables of your old and new Android phone to connect them to the Windows PC at the same time. After they are recognized by the software, the two phones will be displayed in the transfer program window. This Android to Android contacts transferring software enables to transfer all files, say, contacts, text messages, apps, videos, photos, music, and etc. between two Android phone. Here, you just need to check "Contacts" and click the "Start Copy" button to bring up the contacts transfer. 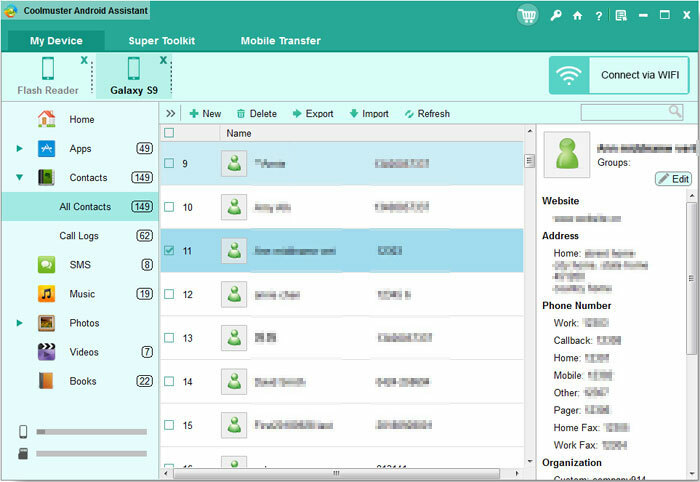 Transferring contacts from one Android phone to another one can be also realized by using another product from Coolmuster studio - Coolmuster Android Assistant or Android Assistant for Mac. It is a comprehensive Android data managing program to help all Android users to transfer contacts, SMS, photos, videos, music, apps, documents and more from Android phone or tablet to computer, and vice versa. Now, it also provide you with the ability of transferring contacts from a phone to another phone. Simple steps with several mouse clicks is enough for you to complete the contacts transfer. Ge the free trial version of Android Assistant and then follow the guide in the below to learn how to use this tool to transfer contacts from one Android phone to another Android mobile. 1: Run Android Assistant after you download and install it on your PC or Mac. 2: Pick up two USB cables to connect your two Android devices to this computer. 3: Highlight the source Android phone and choose "Contacts" from left sidebar. 4. Preview and select the contacts you want to transfer and click "Export" button from top menu. 5. Choose output format and a location on your computer to save the exported contacts. 6. Highlight to the destinated Android phone and choose "Contacts" from left sidebar. 7. Click "Import" button from top menu, browse for the exported contacts and copy them to your destinated phone. 1. Tap Contacts app on your old Android phone. 2. Tap the Menu button and click on "Import/Export" option. 3. Choose "Share namecard via" option and you will be asked to choose the contacts to share. Just tap on "Select All" and then "Done". 4. Select "via Bluetooth" and choose the new device to share the contacts. 5. Turn to your new Android phone and tap "Accept" the file transfer request to begin the contacts transfer process. 1. Tap Settings > Accounts > Google on your old Android phone and select the Google account you would like to sync your contacts to. 2. Make sure you have checked the Contacts' from the list and then tap on 3 vertical dots on the top right corner to choose "Sync Now". 3. Turn to your new Android device and tap Settings > Accounts > Add Account > Google. Then, input the same Gmail account. 4. Make sure you have checked the Contacts' from the list and then tap on 3 vertical dots on the top right corner to choose "Sync Now". After that, the contacts syncing process begins and can be completed within a few minutes. We can also use WiFi to sync contacts from Android to Android. The process is much similar to Bluetooth. 1. Go to your old Android phone, choose Contacts and click the Menu button. 2. Choose "Import/Export" > "Share namecard via" and you will be asked to select the contacts to share. Just choose "Select All" and hit on "Done" to start the process. 3. Select via "WiFi Direct" and then choose your new Android device to share the contacts. 4. Turn to your new Android device and click "Accept" to confirm the file transfer request. Make sure you have enabled the WiFi-Direct on both your old and new Android devices. 1. On your old Android phone, click Contacts > hit Menu button > Import/Export and then select "Export to USB Storage/SD Card" > "OK". Then, all your contacts will be saved on the SD card in your old Android phone. 2. Take the SD card out from the old phone and insert it into the new one. 3. Tap "Contacts" on your new Android phone and hit on Menu button. Choose "Import/Export" and then "Import from USB Storage". 4. Select the file from the SD card and tap on Phone to sync all the contacts to your new Android phone. The last, is also the most clumsy way is typing manually the contacts on your new device. It is the most time consuming so I don't really recommend it. 1. Go to your new Android phone and choose Contacts app. 2. Click on the "+" icon to add new contact information. 3. Now, you can input the detailed information of the contacts, select the storage location and finally hit on "Save" button.